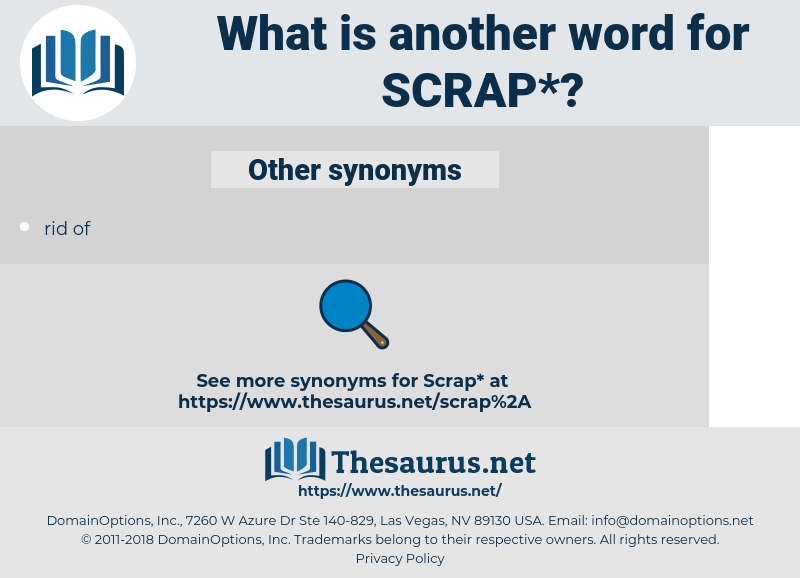 What is another word for scrap? 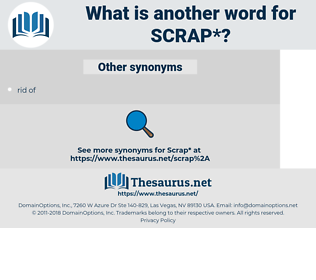 crap, scratch, junkyard, dismantling, scum, leftover, residue, carcass, wreckage, discard, recapture. abolish, Abolishing, dismantle, remove, cancel, cancelled, abandon, demolish, delete, decommission, rescind, renounce, relinquish, dispose, revoke, withdraw, suppress, eradicate, dismiss, annul, lift, erase, waive, dismantling, destroy, destroys, invalidate, stop, drop, discontinue, dissolve, dispel, forego, forsake, tear. eliminate, Eliminating, abrogate, discard, waste. harmony, lot, agreement, peace, load. harmonize, save, accept, hoard, agree, store, make peace, keep. aggregate, sum, entirety, whole, quantity, total, sum total. I'm pretty sure your scrap with Fade didn't have anything to do with his getting shot. And I can see him laughing from here, as if that last scrap pleased him a whole lot. sarape, skiagraphy, scribe, screw up, scrub, serb, scrub up, serf, surf, scurf, shrubby, scarab, scrappy, sugar pea, scare off, sharpie, scruffy, sakharov, scrape, syrupy, Sus Scrofa, scruff, servo, swear off, sherpa, syrup, sorb, shore up, sharpy, serape, serve up, skiagraph, survey, scrapheap, scrape by, scarp, scrape up, seraph, serbia, shrub, scurvy, Schizocarp, swerve, scrubby, soar up, serif, screwup, scarify, scrip, square up, scrapie, scarf, scurfy, sirup, seriph, saccharify, shrive, sharp, sheriff, square off, survive, scorpio, serve.